Celebrating a century of helping women and newborns. Spring was in full bloom at the Flower and Fruit Mission’s annual luncheon on May 16 at the Hall of Springs. 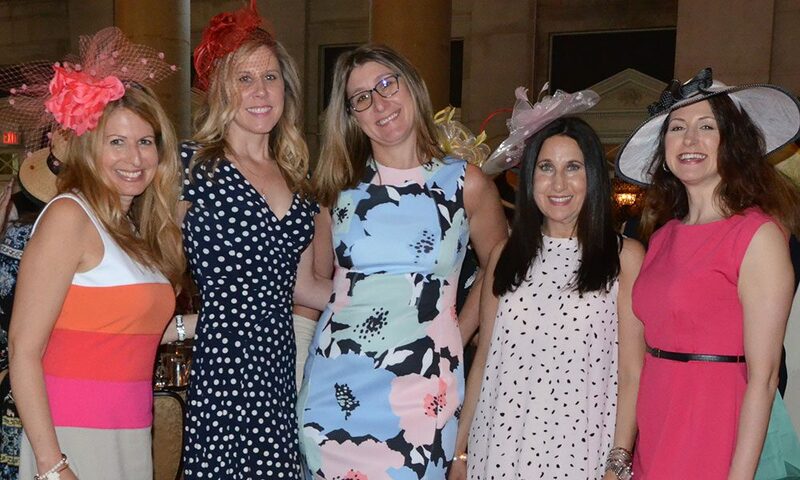 More than 365 ladies wearing brightly-colored dresses with beautiful hats and fascinators came to support the Women’s Health Services at Saratoga Hospital. Guests were given a glass of champagne upon entering and enjoyed the social time greeting each other with friendly smiles and plenty of conversation. The silent auction was filled with beautiful flower arrangements and gifts that represented Saratoga Springs so well. A Carousel Planter designed and handpainted by CAM, Cameron A la Main, depicted the Carousel in Congress Park and was mounted it on a lazy susan so that it could be spun around. The arrangement was donated by Michele Funiciello and Charlene Wood.The Carousel that was previously at Saratoga Lake is a Spa treasure that has delighted kids of all ages since 1911. Another well-known artist, Tom Myott, was painting “Pink Beauty” in the bar area, to the delight of several women looking on. Specialty vendors on hand included Beth Harr and Danielle Patane from Encounter Boutique, and Chelsea Hoopes Silver from Silverwood Home and Gallery. The notable guests included Marylou Whitney, who shared a table with longtime friends Maureen Lewi and Jane Wait, with Marian Wait Walsh and Caroline Wait Putnam. Marcia MacDonald was seated with Charlene Wood and Helen Mastrion. A very lucky Dimitri Znazin, one of two men who came to the luncheon, was surrounded by Joanne Cassidy, Julie Bonacio, Tina Nigro, Katie Neemer and Angela Amedio. As lunch was served, Saratoga Hospital President Angelo Calbone spoke a few words about the Women’s Center and its mission. He was then presented a check from the Flower and Fruit Mission, by committee members Lisa Higgins and Amy Raimo, for $250,000 for the Women’s Heath Services that will be paid over the next six years. Heather Mabee, Whitney’s daughter, then spoke next about the Philly Dake Memorial Award given to a graduating Saratoga Springs High School senior, male or female, who plans to pursue higher education and a career in the medical field.This year 16 applications were received, all outstanding. After a blind selection, the committee chose Mimi Liebers, who plans to continue her education at Holy Cross College. Mimi is the daughter of oncologist Dr. Ed Liebers and wife Jeanette. This year’s luncheon brought in $28,000 in proceeds. Founded in 1904, the Flower and Fruit Mission has supported Women’s Health Services at Saratoga Hospital for over 100 years. From sewing blankets, caps and clothing for infants born at the hospital, and providing flowers and fruit for new mothers and homemade jam for hospital meals, the Flower and Fruit Mission has evolved with the times. The two annual fundraisers today,.the Snow Ball and Spring Luncheon, have raised over $1.3 million for equipment, scholarships, facility improvements and nurse education.